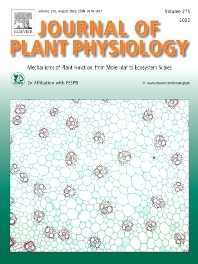 The Journal of Plant Physiology is a broad-spectrum journal that welcomes high-quality submissions in all major areas of plant physiology, including plant biochemistry, functional biotechnology and molecular biology: growth and developmentphotosynthesis and respiration, metabolic pathways, transport and translocation, and plant responses to biotic and abiotic stress. Studies are welcome at all levels of integration ranging from molecules and cells to organisms and their environments and are expected to use state-of-the-art methodologies. Therefore pure gene expression studies are not within the focus of our journal. To be considered for publication, papers must significantly contribute to the mechanistic understanding of physiological processes, and not be merely descriptive, or confirmative of previous results. We encourage the submission of papers that explore the physiology of non-model species as well as accepted models species and those that bridge basic and applied research. For instance, studies on agricultural plants that show new physiological mechanisms to improve agricultural efficiency are welcome. Studies performed under uncontrolled situations (field conditions) will not be considered for publication. The Journal of Plant Physiology publishes several types of articles: Original Research Articles, Reviews, Perspectives Articles, and Short Communications. While Reviews and Perspectives papers are usually invited by an editor, we also welcome proposals for such manuscripts on topics of high current interest to the physiology community. Original research papers comprise the majority of published contributions. Founded in 1909, with roots tracing back to 1818, the Journal of Plant Physiology has consistently published landmark papers in plant physiology, and is one of the world's oldest international journals in the botanical sciences.